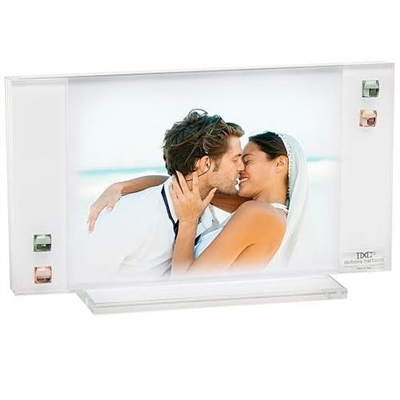 Give your memories a place to shine with this beautiful Debora Carlucci picture frame. The ultimate wedding gift idea, wedding reception, bridal shower, or wedding anniversary present, this 9x5 1/2 Photo Frame With Amber and Teal Crystals features the simplicity of clean lines, and is accented with amber and teal crystals. Any event will be given prominence in this picture frame. Use it as a vanity table accessory, or on an end table. It’s the perfect way to remember your special event. Nice Home Decor. Clean with gentle, non-abrasive cleansers and warm water for best results.